Please read below the list of candidates that have been successful for the Final Fellowship Written Examination of 5th February 2019. Each candidate will be issued with an official confirmation letter from the College of Anaesthesiologists shortly by post. This will contain a result breakdown of your performance on the different components of the examination. 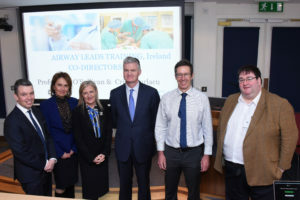 Airway Leads Training – Ireland (ALT-I) was officially launched on 8thFebruary 2019 at the College of Anaesthesiologists of Ireland Merrion Square, Dublin 2. The course was co-directed by Prof Ellen O’Sullivan and Prof Crina Burlacu. The faculty included Dr Mark Halligan, Dr Brian Harte, Prof Conan McCaul, Dr Alistair McNarry, Dr Caitriona Murphy, Dr Jennifer Porter, Dr James Shannon, and Dr Mark Stacey. Please read below the list of candidates that have been successful for the Membership CAI MCQ Examination on 23rd January 2019 Each candidate will be issued with an official confirmation letter from the College of Anaesthesiologists shortly by post. This will contain a result breakdown of your performance on the different components of the examination.